The Huawei B612 and B528 LTE routers are both available in European countries. But they both can work well in Asia. Since they are both Huawei latest routers, many people are not quite familiar with them. 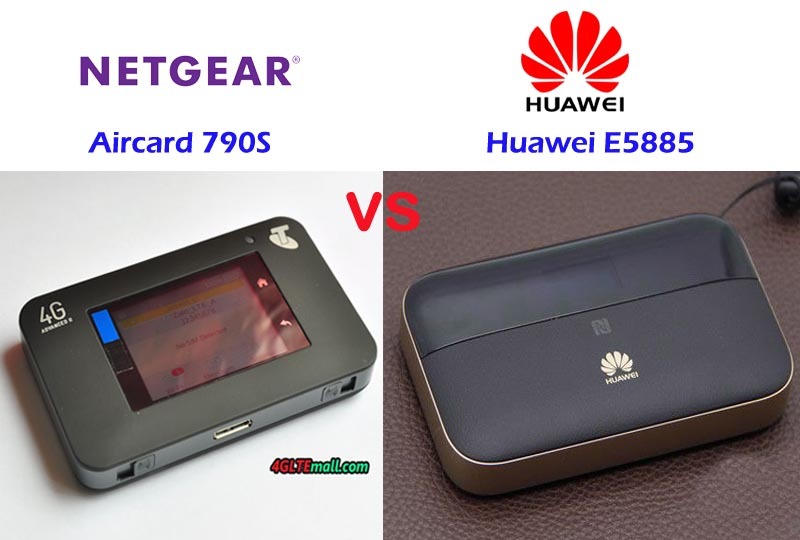 To help the end-consumers to know more about the two LTE modem routers, we will compare the Huawei B612 and B528 specs and features. If somebody would buy one router from the two, they may get some useful tips. 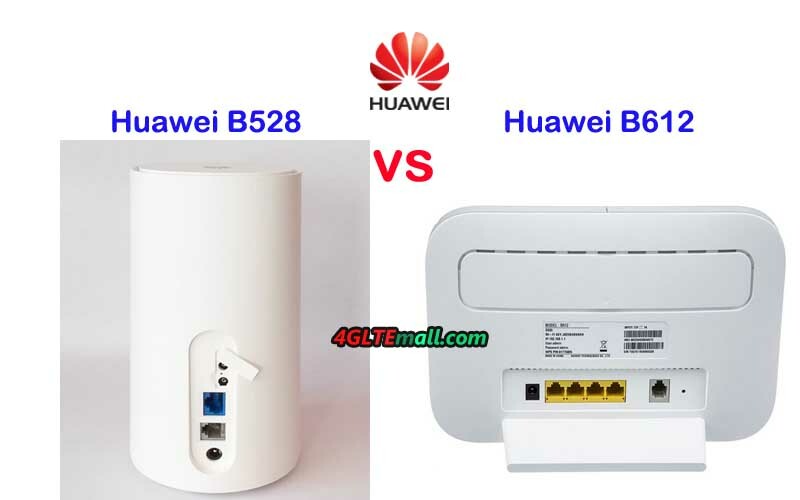 If you had seen the two routers, you will know the Huawei B612 looks like a traditional Huawei router such as Huawei B593 or E5186. But Huawei B528 LTE router looks like a humidifier in cylinder shape, which looks cool and like a furniture. Huawei B612 Router has two variant models supports different LTE frequency bands. The Huawei B528 has only one variant model name B528s-23a, perhaps because it’s only available for Vodafone GigaCube. We are not sure whether there will be new variant model in near future. Huawei B612 can provide only WiFi on single band 2.4GHz for up to 32 wirless users to connect, but Huawei B528s-23 could provide WiFi one dual-bands and support maximum up to 64 wireless users. However, Huawei B612 adopts 4 x 4 MIMO technologies for wireless connection while Huawei B528 only supports 2 x 2 MIMO. Huawei B612 has more interfaces options for users, but Huawei B528 has less interfaces. If your home or office has many devices and have to connect via Ethernet cables, the Huawei B612 may be better. They both have the external antenna connectors: Huawei B612 connector type is SMA-female while Huawei B528 antenna connector type is TS-9, like the Huawei B618 LTE Router. The prices of Huawei B612 and Huawei B528 are very close. So if you would buy one of the two routers, you may focus on the wireless functions and the interface functions. See the difference list, you may have your conclusion about the two routers and will have trouble to buy the Huawei routers. 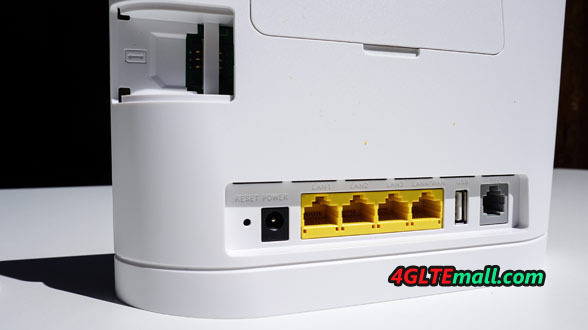 Since 4G LTE networks are more and more popular, people usually need one or more home WiFi router for the terminals at home to access the internet. Huawei had provided many wireless router models for home usage and many of the Huawei Home WiFi routers are very well-known by the users. The Huawei B310 router is one of them. 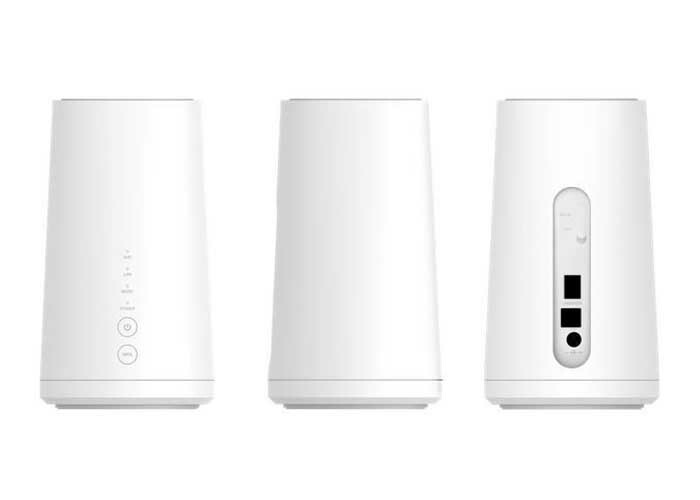 A few months ago, Huawei presented a new 4G home WiFi router named Huawei B612. 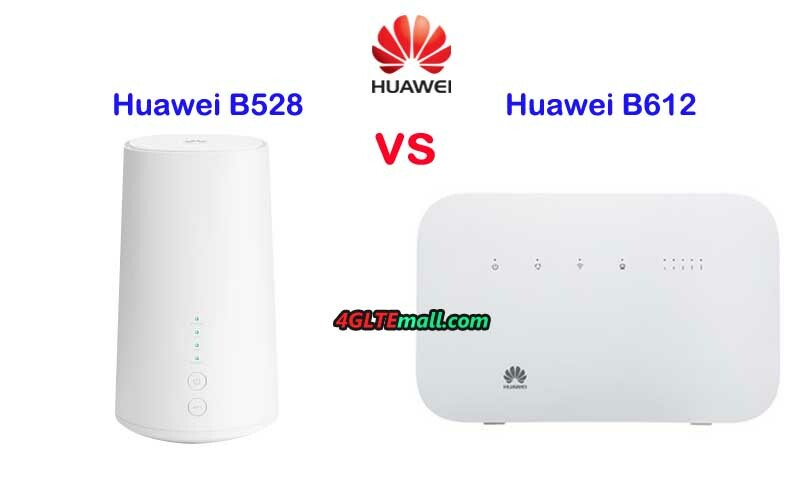 For those people who are looking for a home WiFi router, they may want to know what the difference is between the Huawei B612 and Huawei B310, and which one is better to buy. 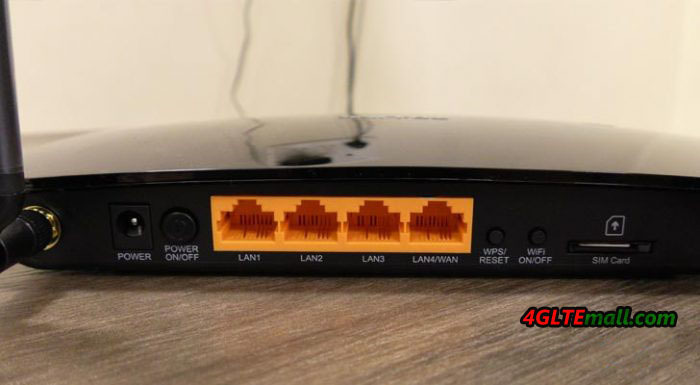 You may check below the images of the two routers and specs comparisons, in the summary, we will list the key difference between them for the reference. Huawei B612 could support peak download speed up to 300Mbps and upload speed to 50Mbps based on LTE Cat6 while Huawei B310 supports peak download speed up to 150Mbps and upload speed to 50Mbps based on LTE Cat4. Huawei B612 Router has two variant models while Huawei B310 has more up to 4 variant models. They support different LTE frequency bands, users to check which frequency bands are available for their network providers and then select the right model to use. Huawei B612 and B310 both support single mode 2.4GHz for WiFi, but Huawei B612 support 4 x 4 MIMO technology, which would improve the data transfer speeds. Huawei B612 has the standard configuration for Huawei 4G routers, including 3 WAN ports, one WAN/LAN port, one telephone port, two connectors for external antennas, and one USB 2.0 port. However, in the Huawei B310 variant models, some of the interfaces may be missing on specific models. If you would buy Huawei B310, you may confirm how many WAN or LAN ports are available, whether there is telephone port in case you want to use some functions but no interface to support. As the newer model and better technology, Huawei B612 price is higher than Huawei B310 price, but if you don’t have much requirements for the router, Huawei B310 is a budget router for home use. 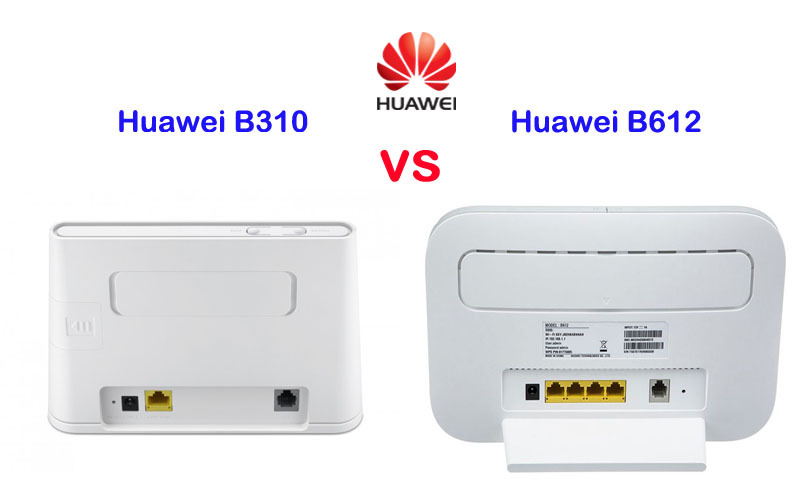 Now you could make a decision of which router to buy between the Huawei B612 and B310 router. Many people know Alcatel 4G WiFi Hotspot, but few Alcatel 4G wireless router with Ethernet ports are well-known. Now Alcatel presented a new LinkHub series of wireless router for home use. The Alcatel LinkHub HH70 and HH40 are the two models for the home station. If you want to know the difference between LinkHub HH40 and HH70, you can check the specification table below for the comparison of the two 4G wireless wifi routers. 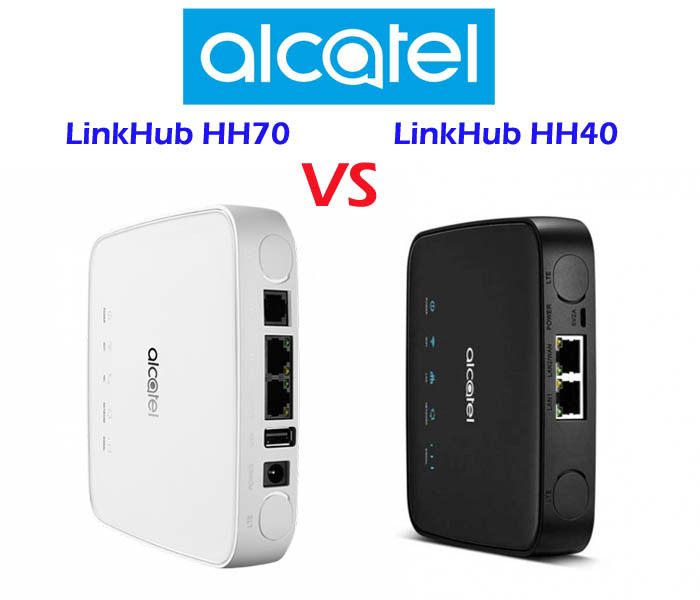 Variant models: LinkHub HH70 has only one variant model now, but Alcatel Linkhub HH40 has two models for different markets: Alcatel HH40V for EU and Alcatel HH40CM for APAC/MEA areas. Interfaces: Comparing with Linkhub HH40, Alcatel LinkHub HH70 has an extra USB 2.0 port for external disk connection and printer, but it doesn’t has the Micro USB port which is available in LinkHub HH40. The Alcatel Linkhub HH70 is advanced than HH40, so the Linkhub HH70 price is higher than HH40. If you would like to buy one home router from the two routers, we recommend the LinkHub HH70. 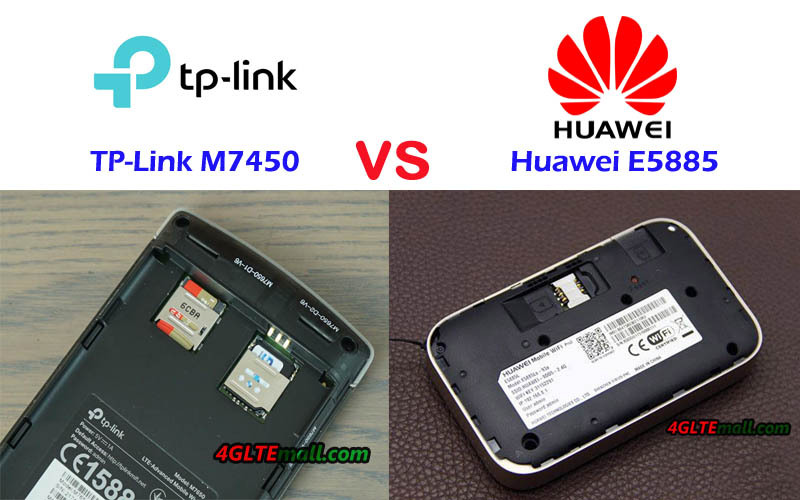 Since more and more network providers worldwide had deployed LTE wireless networks, when the end-users want to buy a 4G WiFi router with SIM card slot, they usually consider the top brand Huawei and TP-link. 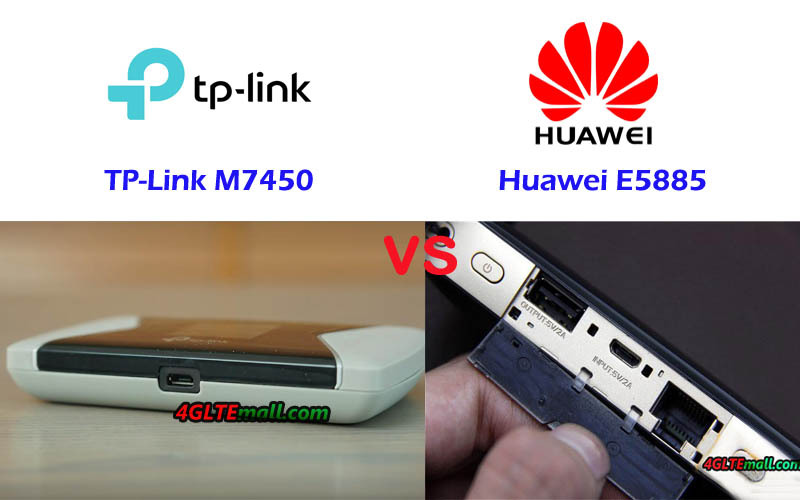 As the famous Chinese network equipment manufacturers, Huawei and TP-link provide similar LTE routers and the similar LTE devices are of course becoming the competitors. The TP-link Archer MR200 and Huawei E5186 router are the two similar routers. For those who are unfamiliar with the 4G WiFi routers, they may find it’s hard to make a decision to buy one. We compare the specs and features of the two routers. If you are interested in the two routers, you may find some tips. From the specs table, we can see the Huawei E5186 is more advanced with the support of LTE Cat6 and could achieve download speed up to 300Mbps, which is almost double of the speed from TP-link Archer MR200. They both have one SIM card slot, four Ethernet ports, and two external antennas. Huawei E5186 modem has two variant models for different LTE frequency bands but TP-link MR200 has only one model, but MR200 supports more LTE network frequency bands. Whether which router is more suitable for you, it depends on your network carrier’s LTE frequency bands. Besides the network compatibility, you may also concern the price of the two routers. Perhaps because Huawei E5186 is more popular worldwide, the price of Huawei E5186 is better than TP-link Archer MR200 price. In our opinion, we think the Huawei E5186 router is better than TP-link Archer MR200. Many people know TP-link is good at wireless router or WiFi router, but TP-link also provides 4G Router with SIM card slot, which may not as well-known as TP-link WiFi routers. 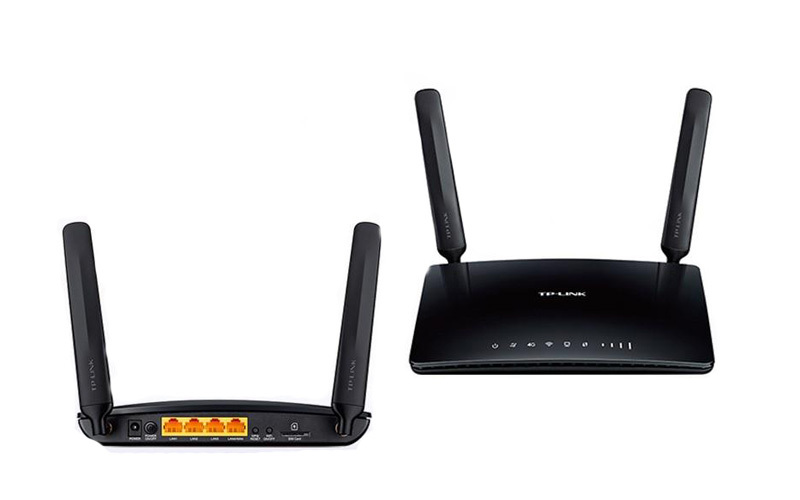 In the few TP-link 4G Routers, the TP-Link Archer MR200 and TL-MR6400 are the most popular two routers. We will compare the TP-link MR200 and MR6400 today to find the difference between the two TP-link routers and which one is better to buy. 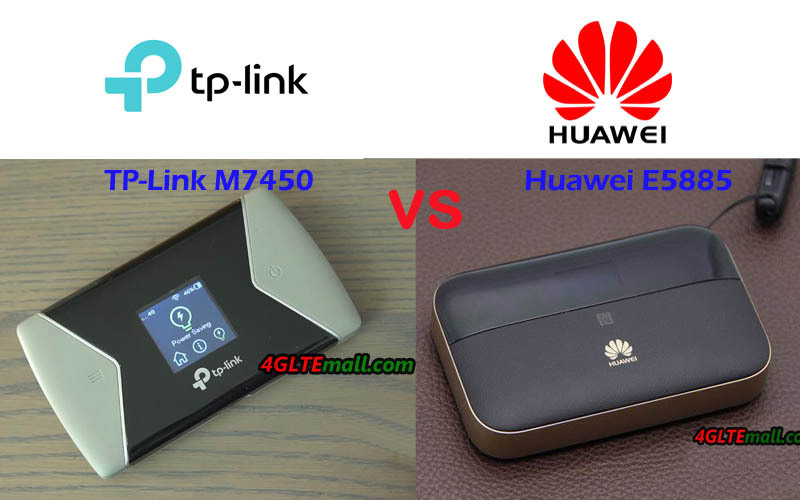 If you are familiar with TP-link 4G Router with SIM slot, you may know the TP-link 4G routers are very similar in the appearance. They are all in black color with two external antennas. The TP-link logo is on the top front with some indicators for connection status. There are some interfaces on the body side, including a power plug, a power on/off button, three LAN ports and one WAN/LAN port, one WPS reset button, one WPS on/off button, and of course, a SIM card slot. From the specs table, we can see the TP-Link Archer MR200 WAN feature is more advanced than TP-link MR6400. Except that the difference chipset, the TP-link MR200 router has three WiFi antennas and supports dual-band WiFi 2.4GHz and 5GHz. 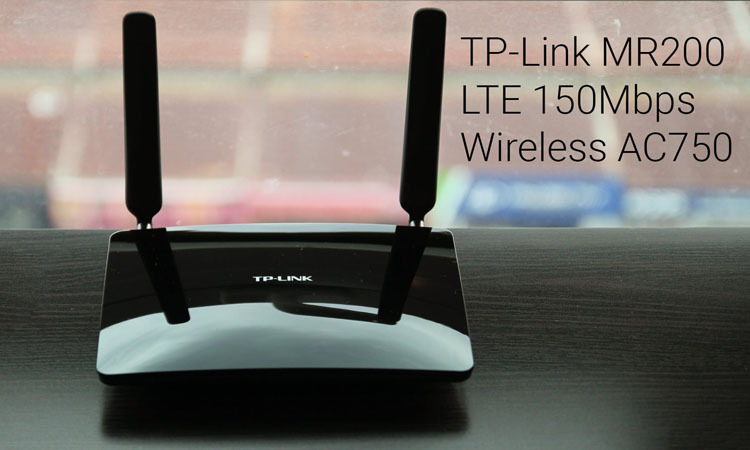 The TP-link TL-MR6400 has two WiFi antennas and supports only single WiFi band 2.4GHz. This feature makes them perform differently for data transmission. So if you would like to buy a TP-link 4G SIM router from the two models, TP-Link Archer MR200 is better to buy. 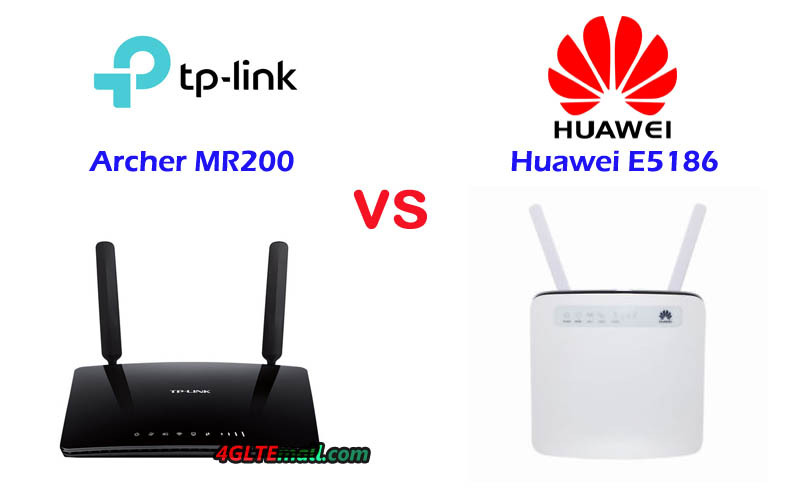 Frankly speaking, both the TP-link Archer MR200 and TL-MR6400 router prices are expensive compared with 4G LTE Routers from other brands such as Huawei 4G Router, ZTE 4G LTE Router. If you can accept other brands, we would like to recommend Huawei E5186 modem and ZTE MF286 LTE Router rather than TP-link MR200 and MR6400. With the cheaper price and better technical specifications, you will benefit more from other brands’ routers. 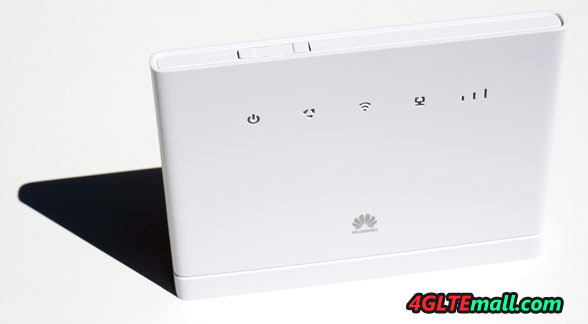 Huawei 4G LTE WiFi Routers are very popular in many countries around the world. As the competitor from China, TP-link also has some LTE SIM WiFi routers available, but not well-known as Huawei routers. 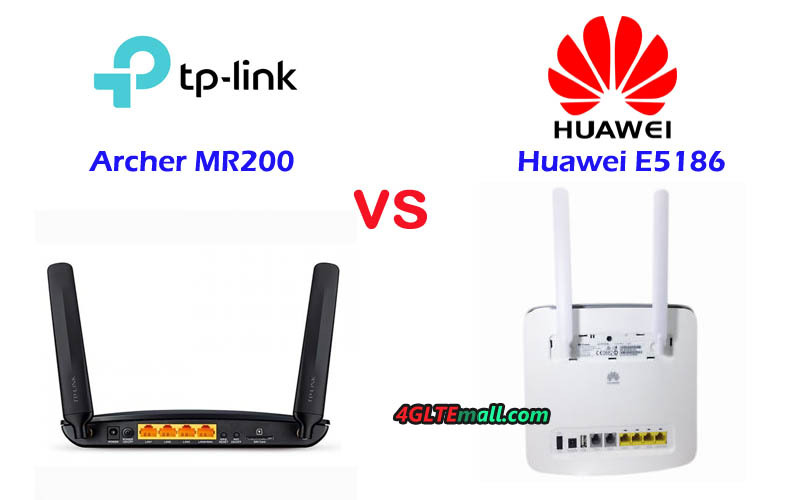 So many people usually compare the routers from Huawei and TP-link, such as the hot model TP-link Archer MR200 router and Huawei B315 modem router. They want to know which one is better to buy for home or office. 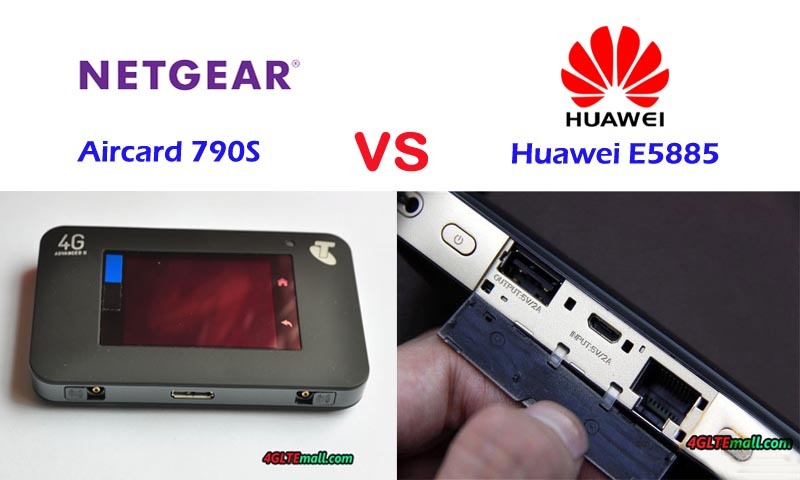 To answer the question, it’s necessary to see the difference between the Huawei B315 and Archer MR200 and then conclude. Like other TP-Link 4G LTE WiFi router, the Archer MR200 stands horizontally on a desk. The TP-link logo is on the top front. There are some indicators on the front, including the Power, Internet, 4G, Wireless, LAN, WPS and Signal strength. On the back, there are 3 LAN ports and one LAN/WAN port with the power on/off button, WPS reset button, WiFi on/off button, and SIM card slot. The TP-link MR200 has two external antennas available with the router. 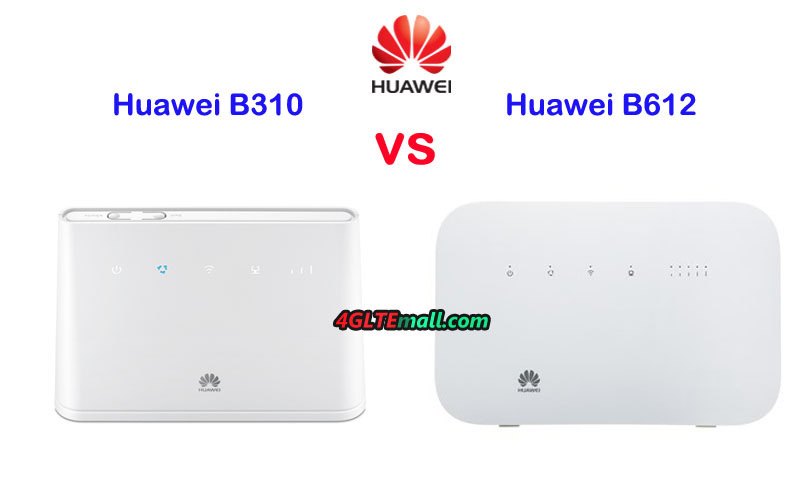 Huawei B315 is standing vertically like other Huawei 4G routers. On the front, there are indicators available for Power, Mode, WiFi, Ethernet and Signal strength. On the back, there are 3 LAN ports and one WAN/LAN port with one USB port and one Telephone port. The SIM card slot is at the side of the router. There are two connectors for high gain lte antennas. Since Huawei B315 has many variant models, some of the interfaces may be missing on specific variant models. From the spec table, we can see the both the TP-link Archer MR200 and Huawei B315 are LTE Category 4 routers which could support peak download speed up to 150mbps and upload speed to 50mbps. 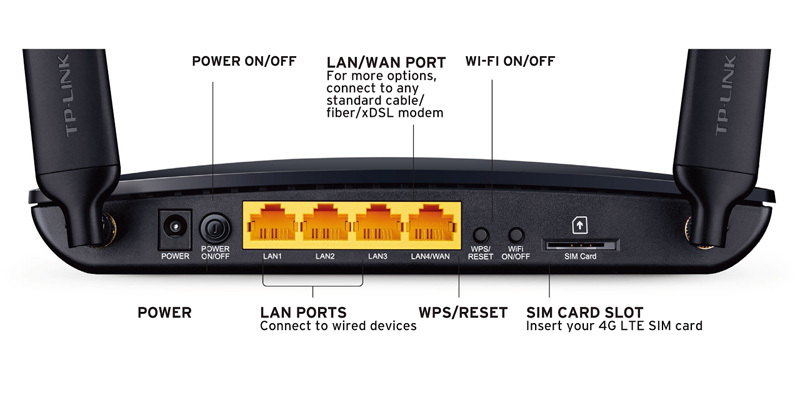 As the typical home router, they both have similar router functions for wireless connection or Ethernet cable connection. The Huawei B315 has many variant models, which may have one telephone port. The variant models of Huawei B315 makes it could support more network providers. The TP-link Archer MR200 has only one variant model and focus on the common LTE frequency bands in Europe, Asia, Middle East and Africa markets. When we see the price, we feel confused. The TP-link Archer MR200 price is much higher than Huawei B315 price. 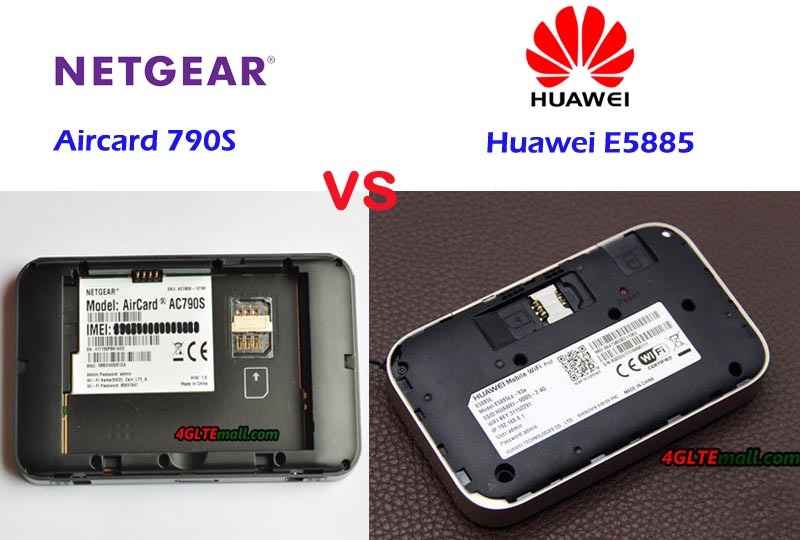 We suppose the Archer MR200 is not as popular as Huawei B315 modem. For those who want to buy a good home router, we recommend Huawei B315 router. But the LTE frequency bands may vary on different carriers, you must select the right model per your network provider.